You are here: Home / Child Friendly / Eve’s Pudding – simple and delicious! Eve’s Pudding – simple and delicious! I love autumn, I love the colours, the sound of crisp leaves under foot and I love Bramley apples. 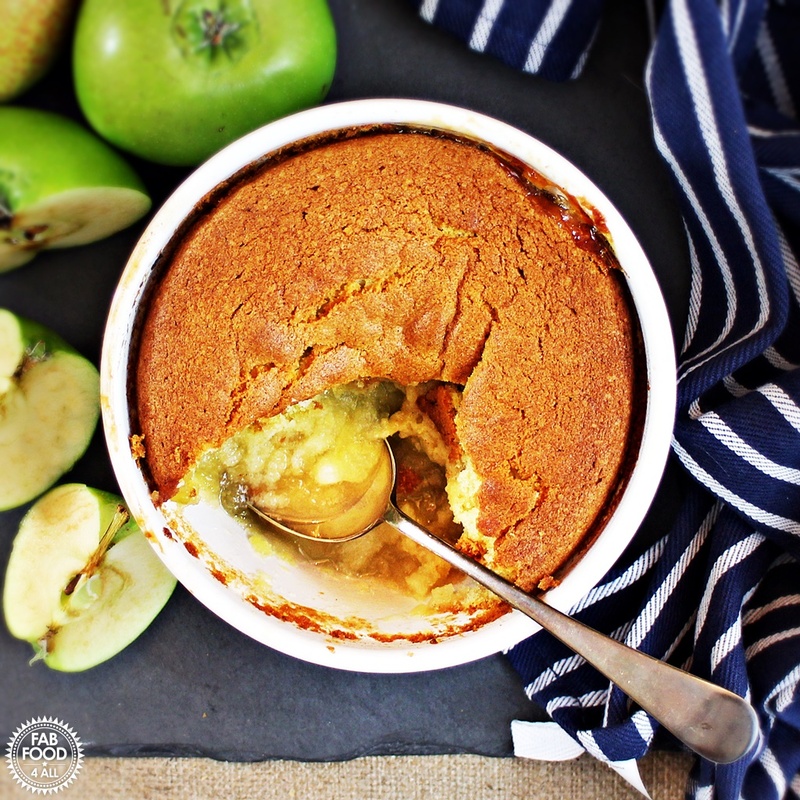 Every time I see Bramley apples in the supermarket I reach out and buy another pack because they are so delicious and quickly transformed into a delicious pudding. So yesterday rather than making another crumble I remembered Eve’s Pudding which I first made at school and hadn’t made for years. When I served my Eve’s Pudding and custard to the family they all loved it and my daughter asked why I hadn’t made it in years. I couldn’t even remember having made it in her life time but I must have used someone else’s recipe as my school one was so incomplete. So now I’ve developed this fuss free version I will be making this on a regular basis. We all need comfort food, it’s good for the soul and our well being. Having a bowl of Eve’s Pudding and custard is like having hug in a bowl. Eve's Pudding - simple and delicious! 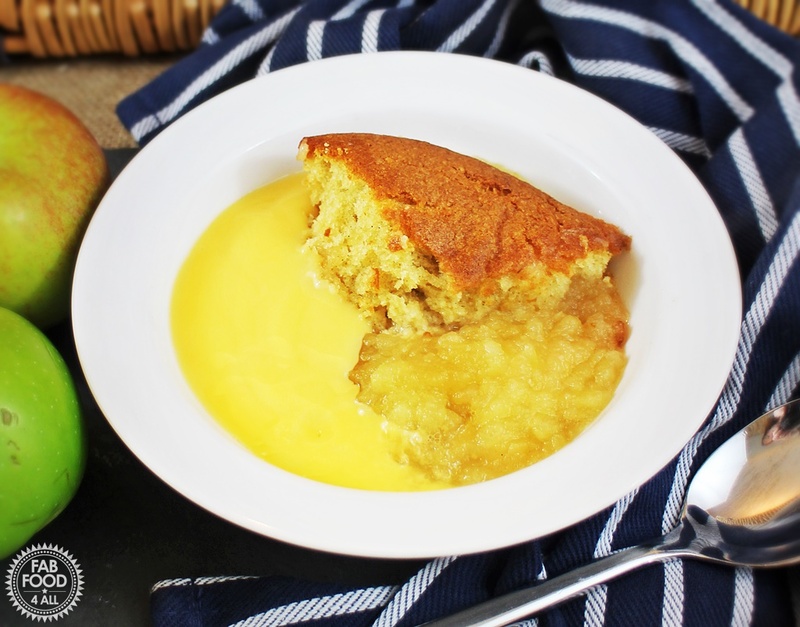 Eve's Pudding is a British classic, a layer of stewed apples is topped with a vanilla sponge for the ultimate in comfort food, serve with custard or vanilla ice cream! Put the lemon juice and water into a pan. Peel, core and quarter the apples, then cut each quarter into 3 slices (add the slices to the pan as you go along, giving a stir to coat). Sprinkle the granulated sugar over the apples and simmer (under a lid) on a medium heat for about 5 minutes or until the apples are cooked through. Once ready take off the heat and transfer to a 15 cm souffle dish to cool. To make the sponge topping use an electric whisk to beat together the buttery spread and caster sugar until light and fluffy. Next beat in the vanilla bean paste, followed by the egg a little at a time. Fold in the flour a tablespoon at a time. Spread the mixture over the apples. Bake in the oven for 40 – 45 minutes (or until an inserted skewer comes out clean). This pudding sounds just incredible and completely up my street. I love to make an apple cake that I serve as a pudding sometimes and I can’t fill my face fast enough. So this recipe is definitely going to be on my Sunday Lunch list and soon. 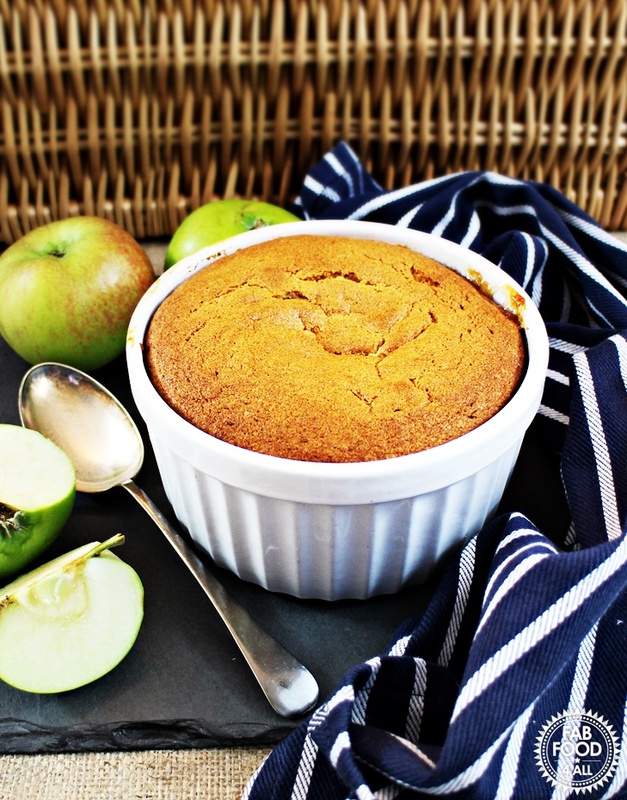 I love my apple cake but it doesn’t feel like a pudding when I’m making it! I’m not sure why that matters but it sometimes does. Pinned! Simple and delicious indeed. I love apples. My husband made this for me last night. It was so lovely that he ihad to make another tonight.